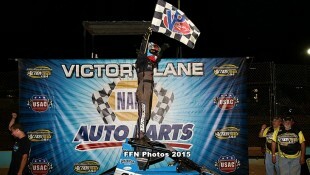 Clanton Snaps 66-Race World of Outlaws Late Model Series Winless Streak With Dramatic Final-Lap Pass At Screven Motor Speedway :Racers Guide – The Web's #1 Racers' Online Directory! SYLVANIA, Ga. – Feb. 7, 2015 – Shane Clanton doesn’t have to worry about going winless on the World of Outlaws Late Model Series in 2015. The 39-year-old Zebulon, Ga., driver, who last season failed to win a WoO LMS event for the first time since the national tour was restarted in 2004, made his long-awaited return to victory lane with a dramatic triumph during Saturday’s Winter Freeze V finale at Screven Motor Speedway. Snapping a 66-race WoO LMS winless streak that stretched back to June 1, 2013, Clanton overtook Steve Casebolt of Richmond, Ind., on the final lap of Saturday’s 50-lap A-Main to earn $10,550 for the 21st WoO LMS victory of his career. 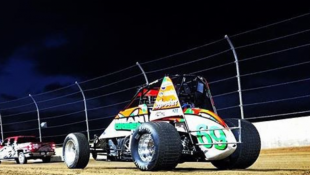 Casebolt settled for second in wrapping up an impressive weekend that saw the Hoosier State driver claim his first-career WoO LMS victory during the tour’s season-opening race Friday night. Brandon Overton, the Evans, Ga., driver who finished second to Casebolt in Friday’s A-Main, was third in Saturday’s feature after charging forward from his fifth starting spot and leading six laps early in the race. 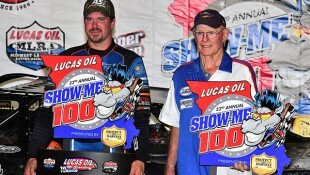 Billy Moyer of Batesville, Ark., followed his third-place finish on Friday with a fourth-place effort Saturday evening, while Casey Roberts of Toccoa, Ga., gave home-state drivers three top-five positions after taking the fifth spot from polesitter Tim McCreadie of Watertown, N.Y., late in the race. 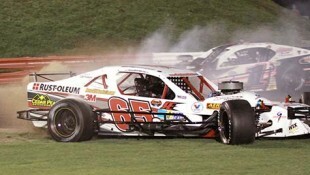 Clanton’s dramatic charge to the lead nearly came too late. After riding among the front-runners the entire race, the fourth-starting Clanton was third when the race’s only caution appeared with 41 laps complete. 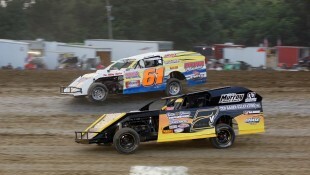 The ensuing single-file restart marked the beginning of Clanton’s rally. He immediately began pressuring Overton for the second spot once the race went back green, making multiple low-side challenges. Clanton first edged ahead of Overton on lap 45, but it took until lap 48 for him to complete the pass. Clanton quickly erased Casebolt’s slight advantage and was on the leader’s back bumper by the time the white flag waved. Another hard charge into turn one allowed Clanton to drive alongside Casebolt through the center of the corner and he completed the pass after the two cars made contact exiting turn two. “They started sliding there in lapped traffic and I was just biding my time, waiting for the signal for five to go,” said Clanton, whose Ron Davies-owned Capital machine carries sponsorship from Weldbank Energy, Hornburg Oil, Penn Gold Well Services and VP Racing Fuels. “We had that restart and it was single-file, so I knew it was time to go. 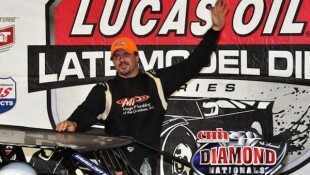 Casebolt made no complaints over Clanton’s aggressive final-lap move. 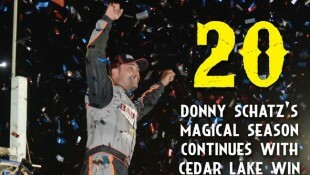 He was actually happy to hold on to the second spot after his Club 29 Race Car began to fade late in the race. “It’s just a shame to lead that much and get passed on the last lap,” said Casebolt, who midway through the race pulled away to a more than straightaway advantage after emerging from an early battle with Overton. “Shane drove her down in there and just beat me. 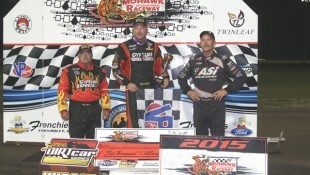 The runner-up performance wrapped up an impressive weekend for Casebolt and his new Tye Twarog-owned race team. 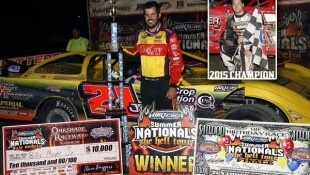 Along with his victory and second-place finish, the former Eldora Dream winner also notched a sixth-place result in Thursday’s unsanctioned tune-up event at Screven. 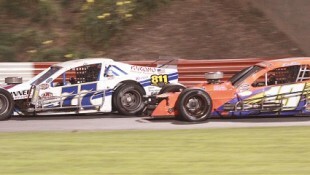 The lap-41 yellow flag that set up Clanton’s late charge was the race’s only caution. 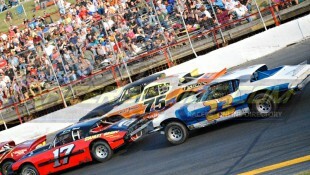 It occurred when Roberts tangled with Josh Richards of Shinnston, W.Va., while the two drivers battled for the sixth spot. 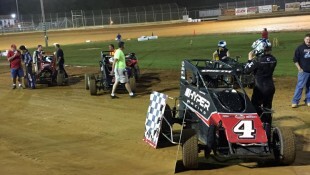 The contact sent Richards for a spin, relegating the three-time WoO LMS champion to a 15th-place finish and marking the first time in seven WoO LMS events at Screven that he failed to finish among the top five. The pole-starting McCreadie was never a factor in fading back to sixth at the finish. He was followed by 2015 WoO LMS Rookie of the Year contender Mason Zeigler of Chalk Hill, Pa., in the seventh spot. Morgan Bagley of Longview, Texas, finished eighth with 2011 WoO LMS champion Rick Eckert of York, Pa., and Chub Frank of Bear Lake, Pa., rounding out the top 10 finishers. 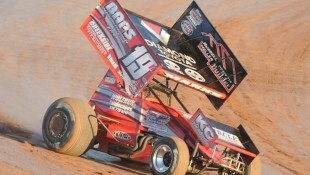 Screven’s Winter Freeze doubleheader kicked off a busy stretch of WoO LMS racing in Georgia and Florida. The tour moves next to Bubba Raceway Park in Ocala, Fla., for a pair of $10,000-to-win events during the Bubba Army Winter Nationals Feb. 14-15 A $5,000-to-win DIRTcar-sanctioned event on Feb. 13 precedes Ocala’s WoO LMS doubleheader. The WoO LMS wraps up its February slate with three $10,000-to-win programs during the DIRTcar Nationals Feb. 19-21 at Volusia Speedway Park in Barberville, Fla. The DIRTcar Nationals also include three DIRTcar-sanctioned events Feb. 16-18. 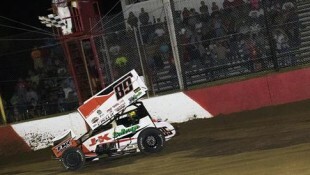 For more information on the WoO LMS, visit www.worldofoutlaws.com. 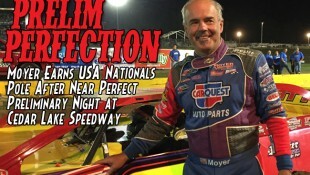 Fans can also follow the WoO LMS on Twitter at Twitter.com/WoOLateModels and Facebook atFacebook.com/WorldofOutlawsLateModelSeries. Time of Race: 14 Mins., 49 Secs. Margin of Victory: 0.639 Secs. Heat No. 1 (10 laps – Top 4 Transfer): Overton, Roberts, Eckert, Smith, McDowell, Mitchell, Hollenbeck, Stone. Did not start: Knoll. Heat No. 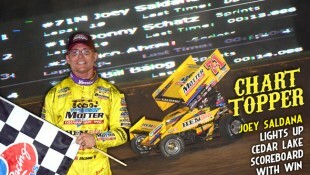 2 (10 laps – Top 4 Transfer): Casebolt, Moyer, Richards, Knowles, Lanigan, Lawler, Beard, Manka. Heat No. 3 (10 laps – Top 4 Transfer): Clanton, Zeigler, Frank, Briggs, Sanders, Junghans, Blashe, Blackmon. Heat No. 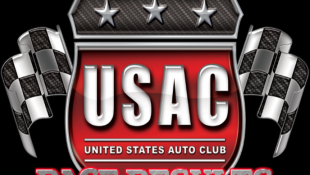 4 (10 laps – Top 4 Transfer): McCreadie, Bagley, Heckenast, Nipper, Wells, Ligon, Yaggy, Barrow. B-Main No. 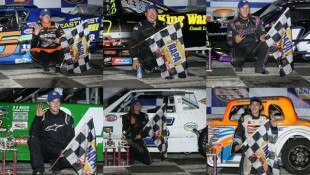 1 (12 laps – Top 3 Transfer): Lanigan, McDowell, Lawler, Beard, Mitchell, Hollenbeck, Stone, Manka. DNS: Knoll. B-Main No. 2 (12 laps – Top 3 Transfer): Wells, Junghans, Sanders, Yaggy, Ligon, Barrow. DNS: Blashe, Blackmon.